hopefully you will enjoy these photos of it too! various smaller objects by nailing chicken wire to the backs. can be found in the craft sections at most stores). to the chicken wire by fishing line. To find the quotes, I just googled "quotes about the sea"
printed them out on card stock paper that I had aged. age paper, see the post "Aging Paper" and "Aging Book Pages". I have enjoyed it anyway. stuff came from Hobby Lobby (on sale or using coupons). The balls of shells were a happy discovery at Michael's. They were on clearance, three in a pack for $4. pop right off when summer is over). The angel's praying hands were easy to just place a shell onto. watching over the "Sea Sayings" vignette" from the coffee table. wrapped around him, I'm calling him "Beach Boy". The "ribbon" reminds me of fishing net. His fishing net has small shells and starfish attached to it. refinished the top and painted and crackled the bottom. It is now one of our favorite pieces in our home. ps. Love the refinished piece! So many ideas I see are similar to one another. This is such a unique display. I LOVE it. 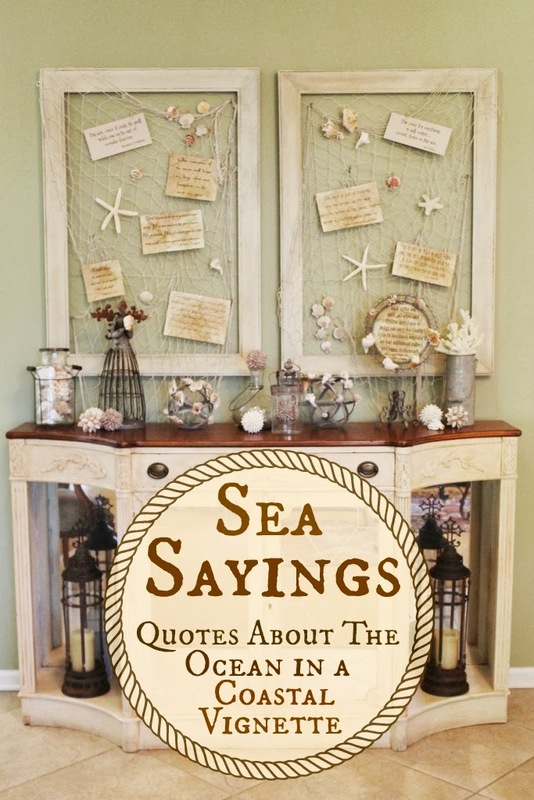 I might add some sea quotes to my beach pail and shell mantel. 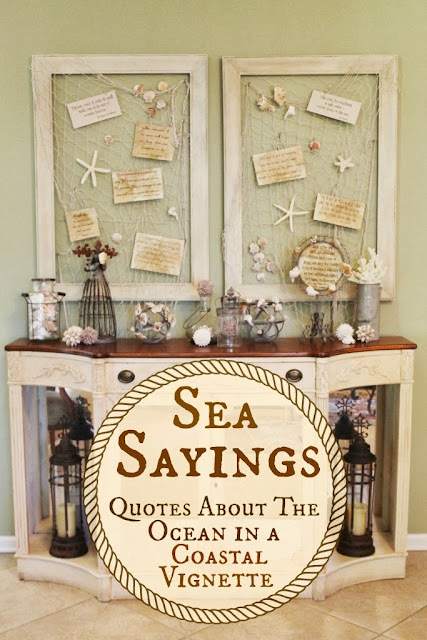 I love your display for the quotes about the seaand your little staure is too cute with the ribbon and tiny shells. You really have a gift for decorating! Adorable! I love seashells, cherubs and quotes. I love how you put the quotes on card paper and then aged the quotes with coffee grinds. Great Idea! So beautiful! Love the stained top - I am loving that look lately! that is a FABULOUS vignette! I love the antiqued look of the papers, the NETTING! and the nautical writing you even put over the picture. that's beyond my skill level, lol. Loving all of your seaside touches! I love your coastal vignette and the frames are fabulous! Thanks for joining the Open House party. I love all of this!!!! Thank you so much for sharing and now I'm ready to shopping and crafting!!!! This is just so beautiful and I'm in aw of your creativity!! !